It was a publicity stunt, but if there was anyone who knew the value of publicity and the ideas behind them, it was Ned Skeldon. Next-day coverage of Skeldon's swim (click to read). “His life, the way he lived it, his limitless optimism, and boundless enthusiasm or ideas were legend in a city that has had no shortage of colorful political characters,” wrote The Blade’s Pat Green upon his death in September, 1988. 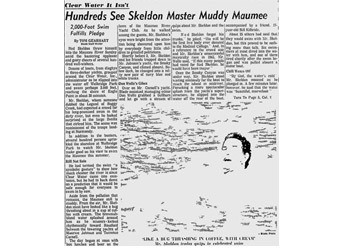 Skeldon did a lot more in his life, and a lot more for Toledo and the entire area, than just take a swim in the Maumee in 1973. – He suggested a city-county office building in 1963, and it was eventually built, albeit almost 20 years later. – He suggested downtown pedestrian malls to help the area long before the concept of “suburban flight” destroyed downtown retailing. One part of the concept was a bus loop. – Baseball fans have Skeldon to thank for the Mud Hens: he was the driving force behind bringing a team to Toledo in 1965, as well as the creation of the ballpark, and the Lucas County Recreation Center in Maumee, from the former Fort Miami Race Track. The stadium was renamed in his honor in 1988. – I was under the impression that Children’s Wonderland, the odd Christmas attraction held for many years at the Rec Center, was his idea. While I couldn’t find any proof, as a county commissioner he announced the appointment of a promotional committee before the first display in 1963 (ah, another post for later!). Born in South Toledo in 1924, and a product of Central Catholic and the University of Toledo, he returned to Toledo after World War II after serving in the Navy. After briefly working for future governor Michael DiSalle, he got involved in city politics. He was a city councilman (and vice-mayor). He served on the board of the Toledo-Lucas County Port Authority. He ran for mayor in 1965 but lost to incumbent John Potter. After he left elective office in 1966 he became the head of Clear Water, Inc., an organization formed (at the urging of The Blade, who ran a series of articles detailing what a polluted mess the western end of Lake Erie was) as a coordinating agency to clean up the Maumee. Nor was it an new problem: this July, 1936 News-Bee article reported that the Ohio Department of Health thought Toledo would never see a clean river. Every mile of the riverfront is polluted and disease-ridden and was probably lost to Toledo forever for swimming (this story appeared at the height of what was probably Toledo’s hottest stretch of weather ever). 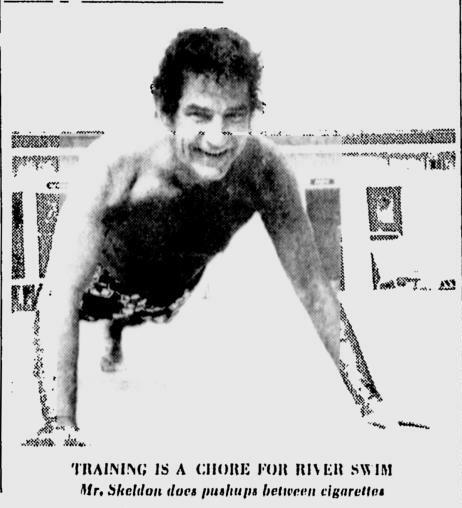 Ned Skeldon "trains" for his swim (note The Blade's caption). 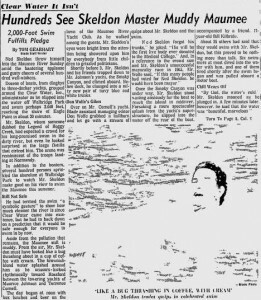 And so, on a Sunday afternoon in July, 1973, surrounded by boats and urged on by The Blade’s Don Wolfe, Skeldon hopped into the river from a boat off Walbridge Park and swam 2,000 feet to the shore of Eagle Point in about thirty minutes. “He had termed the swim ‘a symbolic gesture’ to show how much cleaner the river is since Clear Water came into existence, but he had to back down on a prediction that it would be safe enough for everyone to swim in by now,” wrote The Blade’s Tom Gearhart. The article is extremely tongue in cheek and makes more than one mention of cold beer and highballs. A story a month earlier goes even further, describing Skeldon’s training regimen of swimming laps in his apartment complex’s swimming pool. And beer. The one flaw in his training program may be tobacco. He says that he has cut down to two packs a day and thinks that’s still too much. Clear Water was originally envisioned as a coordinating agency for government and citizens interested in cleaning up the Maumee River basin. It worked with the State of Ohio to form the Ohio Water Development Authority, a funding agency for state and federal funds. It ceased operations in 1978. “We’ve done the job that we set out to do and we’re going out of business,” Skeldon told The Blade at the time. He suggested a city-county office building in 1963, and it was eventually built, albeit almost 20 years later. He suggested downtown pedestrian malls to help the area long before the concept of “suburban flight” destroyed downtown retailing. One part of the concept was a bus loop. Mud Hens fans have Skeldon to thank for it was his idea to bring back the Mud Hens to Toledo in 1965, as well as the creation of the Lucas County Recreation Center in Maumee. The former Fort Miami Race Track grandstand was converted to a baseball park (and renamed in his honor in 1988). I tried to find some evidence Children’s Wonderland was his idea (for some reason, I thought it was) but I couldn’t. However, he was commissioner at the time and did announce the appointment of a promotional committee before the first display of the Christmas tradition in 1963.